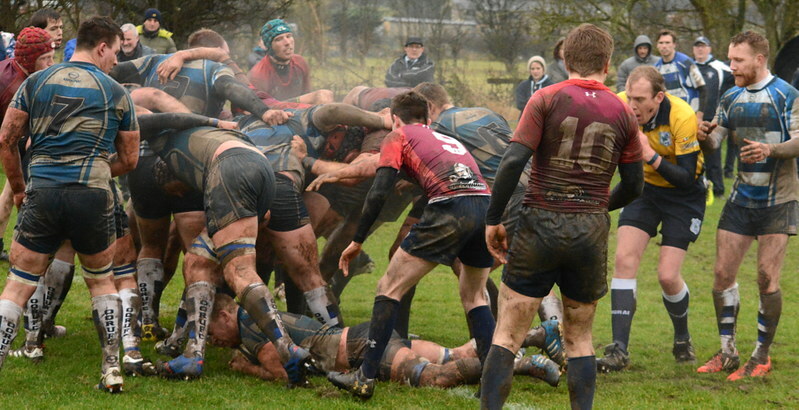 Three scrum pushover tries to two breakaway tries tells of a somewhat topsy-turvy game. The home side almost completely dominated possession and territory, the forwards outplaying their opponents in the tight and rucks, but the visitors showed determined defence and tackling in the threes and deprived the ‘Ensians of any scoring out wide. The backs playing their preferred expansive game throughout was perhaps not the best option and frustration grew as Sheffield tackled and tackled to the end. Lacking several players through injury, ‘Ensians had Murphy back in the 15 shirt and Cowdell in the centre, with Arbuckle’s absence necessitating skipper Featherstone continuing at No.8. As the scorer of all three tries, Sam enjoyed his afternoon and the former were prominent in their bursts through the middle of the field. However, scoring opportunities for the backs did not turn into points and they had to be satisfied with the final result. Will Cooper was in good form with the boot, both out of hand and from the tee and the first two tries were turned into 7 pointers with beautifully struck conversions. Will was subbed midway through the second half due in part no doubt that he had been called up by Yorkshire U20s for a match on Sunday. Luke Cowdell took over the kicking duties and his conversion of the third try was a lovely kick. Half time came with the hosts leading by 7-0, but scarcely a minute into the second session, Sheffield had dribbled/fly-hacked the length of the pitch to score in the corner; the touchdown was dubious, but the board showed 7-5 and that closeness was hard to fathom. A scrum walkover try for ‘Ensians brought some relief at 14-5, but a further runaway try for the visitors again reduced the margin. In the end 14-10 became 21-10 from the third pushover effort from the dominant ‘Ensian pack and justice was done. Sheffield looked dangerous for brief spells, but played so much of the game in their own half that attack was always from distance and their two scores were completely against the run of play. ‘Ensians have much to mull over in terms of tactics on the day and their willingness to run the ball when making little headway was questionable, but the win was important and the forwards certainly had a good day even if the line -out was not as efficient as the scrummaging!